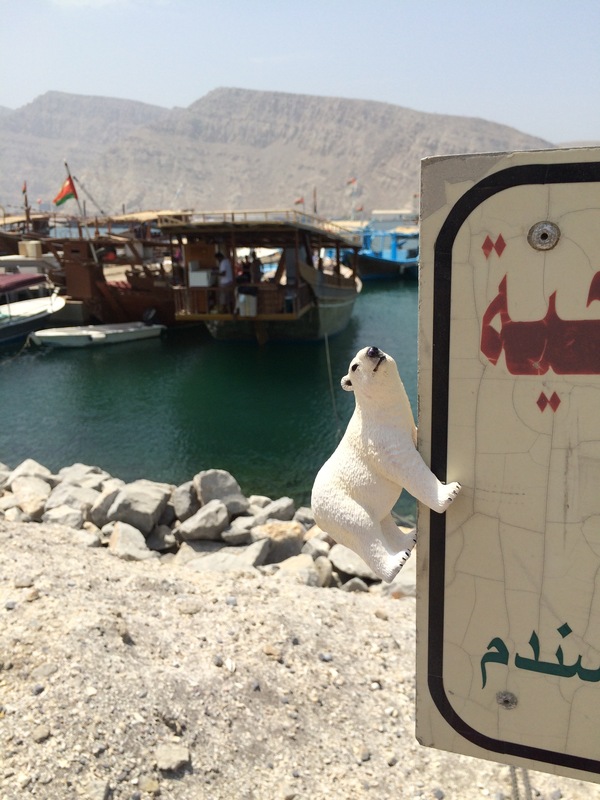 One day browsing through Facebook page I came over a group of people who were planning a trip to the northern part of Oman also known as Musandam, and enrolled myself to be a part of their group since I am a cool polar bear and have my own Facebook page as well. On a warm (around 37 degrees) Friday morning, I climbed to the luggage bag and slept comfortably in someone’s clothes for 3 hours before reaching the very fishy smelling harbour in Oman. This country indeed looks more middle eastern than Dubai does. Particularly, you won’t see any skyscrapers, but mountains instead. The mountains have absolutely no trees or bushes on them, but a lot of goats jumping around. Unclear what those poor goat eat. Or perhaps they have already eaten everything – this is why there is nothing left. I embarked on the boat excited about the trip. The sun was shining and the captain seemed friendly. I was chilling on the front of the boat with a lot of nice people who were enjoying their drinks, while I was enjoying the fishy smell. In Oman fjords it is possible to see dolphins swimming around at certain times of the year, but sadly this time we could only smell them, but they were nowhere to be seen. As the day went by, it was getting hotter and hotter and my nose started to be a little bit sunburnt. Luckily the friendly captain employed a very friendly crew, who was taking a speedboat every couple of hours to bring ice to our luxury boat. I decided to jump on the opportunity of comfortably spending an afternoon in a friendly environment… and to be honest just got out when the stars were high in the sky. The rest of our group was enjoying the wedding music on a small island called the Telegraph island, while I was trying to have an intelligent conversation with a group of Portuguese people about the advantages of seeing the stars against advantages of seeing Burj Khalifa from 90 kilometres away… at which point a couple of overly happy French people arrived and claimed that they can actually see Burj Khalifa from right there where they are standing. I remember how bright were the stars from my home in the Arctic. It is something quite of a view that now drilling guys from Shell are enjoying, instead of us… polar bears. The sparkling stars over the dark waters of Oman reminded me of long lost home. But these days, I am not the only one who has left his home in search of a better future in new lands. My friends, I just want to ask you to help everyone who is in need today because tomorrow it could be that you would find your home with your stars taken away by wars or by the nasty drilling guys. And when everyone is at peace, perhaps then the dolphins will show up… because they are happy creatures and don’t like negative energy. This entry was posted in Oman, Travelling and tagged arctic, bear, bears, burj khalifa, dhow cruise, dubai, friends, khasab, medvedik, musandam, oman, philosophy, polar bear, refugees, ship, thoughts, traveling, travelling, trip. Bookmark the permalink.